Happy Tuesday! It's time to link up with My Day in K and Teach. Talk. Inspire. for their Tell All Tuesday linky! 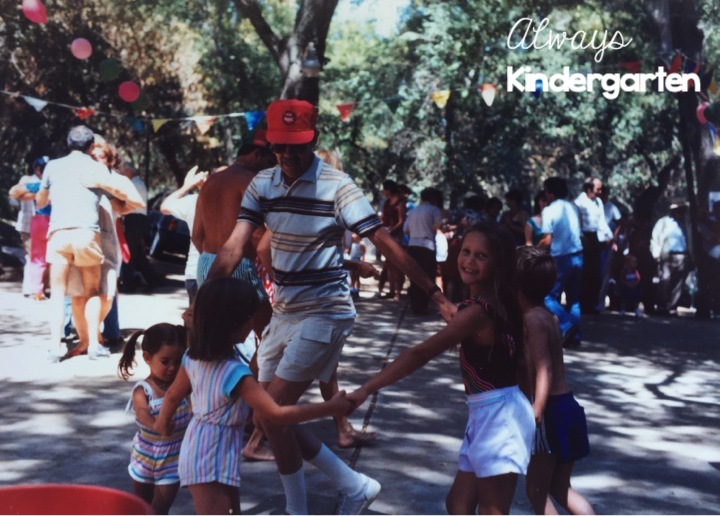 This week's theme is all about summer memories. Pull out your photo albums and find your favorite summer flashback memory! I come from a really big, really loud, Italian family. One of my favorite summer memories is attending the Italian American Club Picnic. Imagine a whole bunch of really loud, really social, really fun loving people together, having an absolute blast and celebrating summer. What's one of your favorite summer memories? 1. Grab the picture & banner and use them to link back to this post on your blog. Love that pic!! So fun!! What a great photo! I love that you can see the couple dancing in the background and your grandfather is totally in the moment enjoying his grandkids. Your summer memory looks like so much fun! What a great experience to get to share with your family! Thank you so much for sharing your memories with us! I had a great time learning more about you!! I love your picture. I loved my grandpa too! Those are the best memories. What a great picture!!! You can just see the joy in your face!!! I'm sure that is a special memory that you will cherish forever. Thanks so much for sharing! Hi Andrea! Thanks so much for linking up with us! Your picture is precious and I understand completely about having a really big and really loud family! You all look like you're having the best time in the picture and I'm so glad you were able to share it with us! Have a great night! Your family photo is amazing!! You all looks so happy and like you are having a great time! Thank you for sharing! !